Click the Donate button to pay with paypal. Friendships are made here!Join us for our monthly meetings beginning at 9:30 a.m. at Temple Israel with our famous lox and bagel breakfast and brief business meeting. We have programs of interest to all. 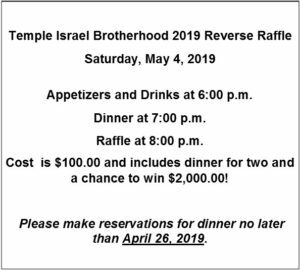 All Temple men are welcome! Brotherhood offers the opportunity to expand one’s circle of friends, to get involved in Jewish affairs, and to contribute to our Congregation. Brotherhood is an auxiliary organization. Our primary purpose is to provide social, educational, cultural and spiritual services for the men, as well as for the broader community. While we provide opportunities for men in our congregation to gather together for fellowship, recreation, personal growth and mutual support, we also work to support the mission, services and activities of the Congregation. For more information please contact Howard Wernow, Brotherhood President.